Dear Channie: What is Your Home School Schedule? – Happy. Homeschooling. Housewife. Dear Channie: What is Your Home School Schedule? So what is you schedule? The question about schedules was one that I struggled with for a long time. My background is in education so when I started homeschooling I followed pretty much the same schedule (including teaching blocks) as traditional schools. It took me a very long time to get comfortable with the radical idea that I could truly create my own schedule and because of that I could make adjustments based on the needs (which sometimes can shift) of my family. Again, this was a radical idea. We do school all year round. The main reason is because my husband and I firmly believe that learning is life-long. We don’t want to raise our girls with the idea of stop and start learning. What we do during the year varies, but the learning never stops. We do take breaks. Breaks for us mean that mommy isn’t teaching any new information. The girls may have worksheets and fun activities to help them review concepts and skills taught. I decide the breaks based on what is happening in our family. For example, we take a week’s break for our anniversary. 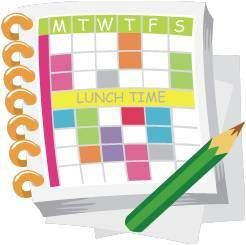 The main thing is to plan out a schedule that keeps your family life in mind. Also remember that a plan is simply a plan, and plans are suggestions–not absolutes. Another things is to take a break when you and your children need it. Feel free to switch things up a bit. It took me many years and failed attempts to discover (or rather uncover) what worked for our family. Give yourself grace to fumble along the way until you find something that makes sense! Previous Our Fourth Grade Reading List! !